Galileo seeks to harness the power of precision fiber optic controls to connect astronomical interferometry telescopes via flexible fiber optics cable, removing the need for rigid light pipes. Fiber optics technology may enable a larger number of interconnected mobile telescopes, which could more quickly capture the data required of an object in geosynchronous orbit from multiple angles, resulting in faster image creation. Image released on Jan. 17, 2012. The U.S. military's "Phoenix" project aims to recycle spare parts from old satellites to create new Frankenstein spacecraft in orbit, but it needs faster telescope imaging to find satellites suitable for cannibalization. 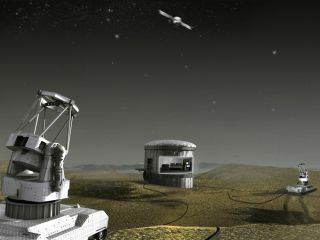 Now it has called for a swarm of mobile ground telescopes capable of spotting possible space targets from many angles. Such interconnected ground telescopes could measure the light reflections of space objects from different angles — a method that allows them to figure out the position and speed of the objects moving across the sky. The telescopes would transmit the collected light to one another through fiber-optic cables similar to those that deliver Internet and TV signals to homes. "We know the fiber-optic control community is engaged in precision control of light," said Lt. Col. Travis Blake, an Air Force officer and program manager at the Defense Advanced Research Projects Agency (DARPA). "If those solutions could be meshed with the unique demands of astronomic imaging, we could develop a new means of better, faster imaging of objects in [geosynchronous orbit]." Today's networks of ground telescopes use rigid "light pipes" to transmit the collected light among the different telescopes. But the setup limits the ability of telescopes to move around and capture images of space objects. That's why DARPA has launched its Galileo program to make a better mobile telescope system that includes telescopes with light-collecting apertures of 5 feet (1.5 m) or greater — similar to telescopes already installed in many observatories. Such telescopes would also need adaptive optics technology capable of screening out the blurry image effect of atmospheric turbulence, as well as a stable, tank-like platform to move around. If Galileo works out, it would go a long way toward helping DARPA's Phoenix project achieve the wild goal of turning space junk into new parts for small satellites. Recycling old satellites could potentially save the military and NASA hundreds of millions of dollars, versus abandoning old spacecraft and coming up with a new system. DARPA plans to brief industry representatives on the Galileo program during a webcast meeting Jan. 31.